Up Side Up is where you can find (and buy) interesting objects that are made by graphic designers. It’s similar to kickstarter where the ideas Up Side Up love will get developed into production runs if enough people hit the buy button. I have made a few videos for them and it’s not just a talking head to camera as I have the prototype objects to play with too! I use two cameras to capture the action and the audio is a separate set up, a Handy H4n . They are very popular, you see them all over the place. They are fairly small but still give great audio results. It’s a far superior sound than whatever the DSLR is able to capture. After being a great stills camera and now a HD video machine there probably isn’t enough room for high quality sound recording just yet… best to keep the whole thing apart. 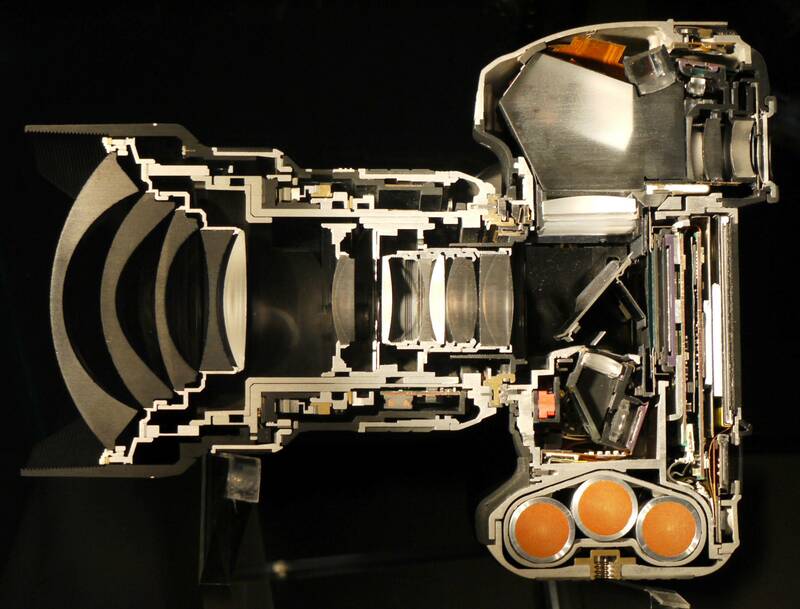 Here is a Nikon D4 chopped in half to give you an idea of the space left inside it. Actually, there is a little space left up above the pentaprism, isn’t there?